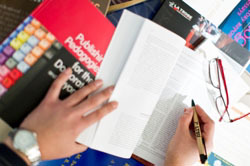 The AIM will teach you about La Trobe's values and its academic integrity standards so you are informed about how to avoid plagiarism and academic misconduct. You will decide about some academic misconduct cases, choose pathways and find out the likely consequences of your decisions. You will also do a quiz. How do you enrol in it? If you are a commencing undergraduate or postgraduate coursework student you will see AIM in your Study Plan and you will need to enrol in it like any other subject. You will be expected to complete the AIM as part of your course requirements. It is best to do it as soon as possible - you are expected to have it completed by the end of the first week of your first semester. There are no credit points for the AIM, but you must successfully complete it by getting a 90% result. Your successful or unsuccessful completion will be recorded on your Academic Record. You can repeat the AIM as many times as needed until you successfully complete it.